Do You Use The Right Water Purifier? Water, being a universal solvent, has the tendency to absorb anything that it comes in contact with. Before reaching your kitchen tap, water must have come in contact with chemicals, pollutants and a plethora of microorganisms that can be harmful to your health. According to UNICEF (India), most school children are majorly affected by two types of water borne illnesses - diarrhoea and worm infections. So, does the water filter we use at home support this purpose? Whatever type of water filter you are using, make sure they are certified from any of these institutions: NSF (National Sanitation Foundation), IMA (Indian Medical Association) , ISO (Indian organization for Standardization), USA EPA (Environmental Protection Agency) or Gold Seal from (Water Quality Association). 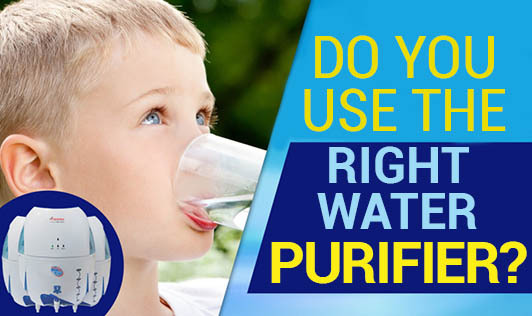 Choose water purifiers based on the kind of contaminants you want to get rid of. Purifiers with activated carbon filters out major pollutants like pesticides, parasites, chlorine and heavy metals such as lead and mercury. These purifiers are not as effective as UV purifiers and need to be replaced frequently for better purification. The RO filtration technique is basically used to remove heavy metals like lead, mercury, cadmium, arsenic, perchlorate, nitrite/nitrate and selenium. The highlight of RO water purifiers is that it can make hard and turbid water taste like soft water. RO purifiers also retain essential minerals present in water. Note: There is substantial water wastage in this purification technique. You can use this water for your plants, to clean your car or even wash your dishes. In UV water purifiers, water is exposed to UV rays to kill disease causing bacteria and viruses. They do not change the taste, odor and pH balance of water. They are usually combined with activated carbon to remove chemical impurities. So, now you know what to look for when you buy a water purifier. Remember to choose a water purifier according to the water quality in your area.